That's right, American Girl doll. I have one and I'm proud of her (not that any of you would be laughing at me because you all are so nice! Right?) I thought since there's not going to be a Sewing Sunday (WHAT? I'll get to that in a sec.) might as well give you a "confession" post. #IDon'tKnow. I've had her for 2 years (that's why her hair is all crazy) Quick Fact- Alisha has a blue Sharpie mark under her right eye but you can't see it because her side bangs are covering it. What do I post about Alisha? I guess her story??? A couple of weeks later, my mom picked me up early from school to go to NYC (if you are wondering where my dad was, he was in Florida seeing my uncle) and when I got home I saw a package, opened. I took a peek inside and I saw an American Girl Doll face looking at me. I jumped and I screamed and hugged my mom. 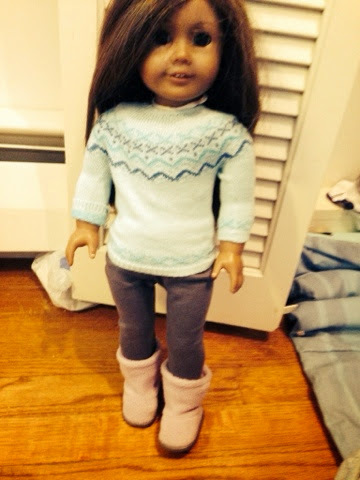 I had an American Girl doll, and clothes for her. I quickly changed my doll into her new clothes and got in the taxi to go to the bus station holding Alisha in my arms (her name wasn't Alisha yet.) We had such a fun time in NYC. I got 1 new set of clothes for my doll and the school backpack set from my mom's friend. This one is a much shorter story. On March 2, I went to see the Lorax with my friend and her friend. My friend's friend was named Alisha. (My doll's name at the time changed daily) I thought Alisha was the most prettiest name in the world. When I came back home, I declared: My doll's name is going to be Alisha!